1-If you don't understand something, ask and don't assume. 2-Be aware that this is a work in progress and not something official nor is it ready to be considered a suggestion let alone an idea as there is still a possibility that such will be changed beyond recognition through your suggestions and assistance. Just like you wouldn't consider a random shard that broke away and flew from a car in a car crash to be a car part let alone a car itself, this is so far from fleshed out that I don't even consider it an idea, but instead an object representing intent to converse over for the sake of a goal in which simply amounts to imagining something closer to realism. In other words, hostility is beyond unnecessary and will be reported. 3-Just because this would not be helpful to your playstyle, does not mean it can't be made a reasonable concept so if you don't have a playstyle this would benefit and have no suggestions for improving the concept, please move along and don't give me more posts to sort through. 4-Be civil and productive or avoid posting. 5-Be aware that this tree concept is in its earliest of stages, I do realize it is flawed and so I bring it to this forum to iron that out. One mind is too inadequate on its own to assume it can see from all necessary angles and so I am asking for cooperation from other minds who understand the motives behind this concept in development. 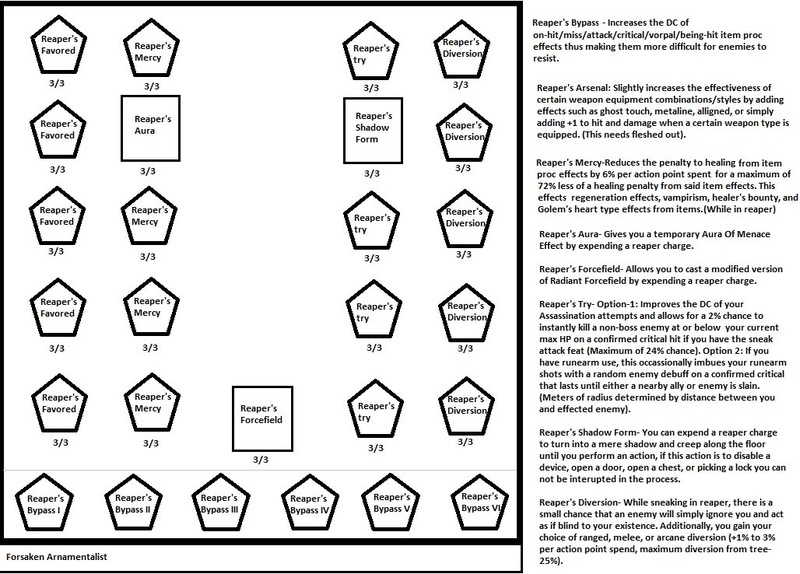 6-I don't play sneak attack builds, I just used another complaint that I see on reaper to try and fill the tree with a solution since my complaint is purely around item procs, so please don't assume for a second that I am really aware of enough to ascertain a good fix for said complaints that sneak attack build favoring players are making. 7-Don't assume something and then build a question around that assumption. 8-Keep it serious, either contribute to fleshing this concept out so it can be suggested or have the restraint required to not reply to this post. Don't see much point of adding another reaper tree. I do think that Dread Adversary Tactics should also boost Assassinate DC as it's no longer restricted to rogues. Everything else would be more suitable as suggestions for changes to Shadowdancer Destiny, which will most probably be tweaked along with other Destines latter this year.